I’m going over to a friend’s house for New Year’s Eve dinner tonight. They’re making crab cakes, I’m making this. Should be quite a meal! After some reading and experimenting this afternoon, I managed to get the plotter to plot arbitrary PDF files. Sweet. I’m hoping to finish the layout for the robot arm this week, and send the design out for fabrication before I start work on the 14th. As part of that effort, I figured I could use the new plotter to make a nice plot of the PCB. Unfortunately, getting that up and running is a little more complicated (only a little) than I have the energy for today. Another time, perhaps. 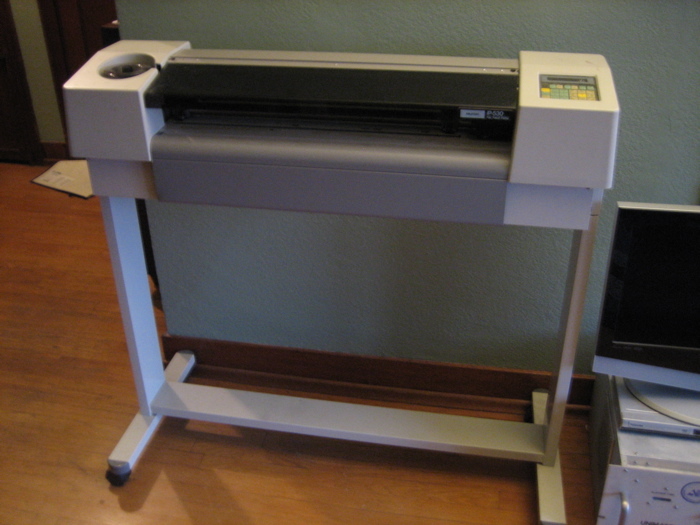 Thanks to Jared & Chika, I became the proud custodian of a plotter today. I’ve got plenty of other projects going right now, so it may be a bit before I get it up and plotting, but it should be fun once I do. Unfortunately, my D70 has been exhibiting some problems lately. Starting a couple months ago, it would occasionally show ‘CHA’ on the LCD instead of the number of images remaining, and wouldn’t record pictures until I cycled the power. I read a bit about this on the inter-webs, and that seemed to implicate my CF memory card. However, when I bought a new one yesterday, it had the same issue. Now the only question is whether this can be fixed by cleaning the contacts on the CF card slot as Nikon technical support suggests, or whether it’s a bigger electrical issue. As you can imagine, I’m not too excited by the prospect of sending my camera away for a couple weeks to get the contacts cleaned and paying a bunch of money for that privilege. Instead, I’m thinking I might try to clean the contacts myself (especially given Mike & my recent success fixing his point and shoot). And while I’m mucking around in there, I might just add an electrical shutter release jack (like these guys do), since the D70 doesn’t have one. I probably won’t start work until at least mid-January, which leaves plenty of time for working on projects, eating well, and a possible visit to Canada. Also on the January schedule is Lei-Out, a beach ultimate tournament in L.A. over MLK weekend. Plenty to look forward to. Big news this afternoon: I got a job! Actually, better than a job, I got the job I was gunning for. This isn’t a blog about work, so the company goes unnamed, but you can always email me if you wanna know more. Following Drew’s advice, I revised the new layout of the site to use CSS elements to format the page instead of tables. It reads a whole lot cleaner (at least the source code does), and I’m liking how it’s looking. Next up, the new Projects page. I’m also still fighting Blogger on one issue. When they publish my blog as an RSS feed, they can’t seem to get the URLs for the individual posts correct. Seems like an easy thing that would’ve been solved long ago, but they haven’t replied to emails, and it’s still broken. Time for WordPress? Things are finally shaping up on the job front, thankfully. It’s definitely been longer than I would’ve liked, but it seems like I’m on the home stretch. In the meantime, I’ve been keeping busy enough. I celebrated Hanukkah by eating latkes 4 out of the 8 nights. Nothing like fried goodness served with sour cream and applesauce to warm your soul. Also an excellent soul-warmer: chocolate bread pudding (from How to Cook Everything). Easy and delicious! Also in food news, Keiran wrote up the results of his virtual ice cream party – sounds like some good ice cream was made. Next on my list is the honey-cardamom. I played last weekend at the unfortunately named Dangle Wrangle, an all-guys frisbee tournament. It’d been a while since I’d played, and we had only one sub for four straight games (two of which were in the snow) – I was sore ’til Wednesday. I’m looking forward to Winter League so I can keep in slightly better shape without having to resort to going for runs. For the first time in my life, I think, I had a completely satisfactory experience shopping at Radio Shack today. I’m doing a bit of consulting and needed to build a quick little circuit. Rather than trekking to Fry’s or waiting for a DigiKey order to ship, I decided to risk the ‘Shack, and it paid off. Unfortunately, I think I’ve used up my once-in-a-lifetime everything-goes-well-at-Radio-Shack trip. After my mom made Nigella Lawson’s Clementine Cake when I was home for Thanksgiving, I decided to give it a shot. I found some great organic satsuma’s, ground up some almonds, and was very impressed with the results, especially considering how easy a recipe it is. I didn’t have a springform pan, but lining a square baking pan with parchment paper worked like a charm.